Minister for Health Rosy Akbar, Minister for Trade and Tourism Faiyaz Koya and Agriculture Minister Inia Seruiratu outside Parliament on July 11, 2018. Photo: Ronald Kumar. Minister for Agriculture Inia Seruiratu says a governance failure led to one of the country’s biggest agriculture scams. Mr Seruiratu highlighted the scam to hit back at Opposition MPs’ claims in Parliament that certain provisions in the 2018-2019 National Budget were aimed at vote buying for the 2018 General Election. Opposition leader Ro Teimumu Kepa said outside Parliament yesterday: “It has been dealt with through various Auditor-General’s reports. “There is nothing else to talk about there,” she said. 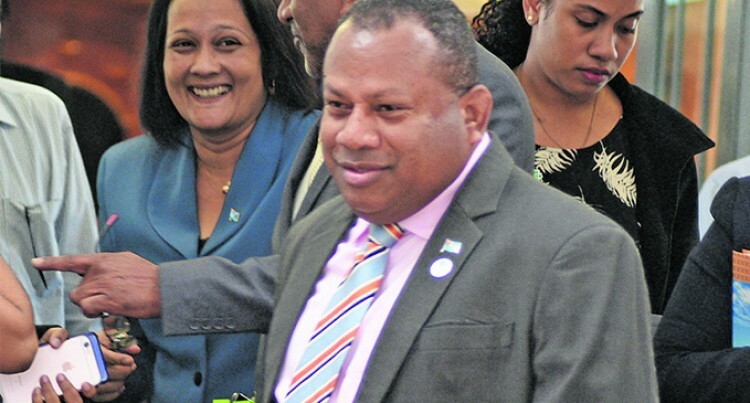 Mr Seruiratu said as the FijiFirst Government believed in putting taxpayers’ money into good use without abusing them for their own political gain. “Let us use good governance. Everybody knows in Fiji that in 2000 to 2001 there was a big agriculture scam in the history of Fiji. Peniaisi Kunatuba was one of the victims, Sakiusa Bole was one of the victims, Suliasi Sorovakatini was one of the victims. This is not good governance and these are taxpayers’ money. “Taxpayers’ money needs to be used responsibly and that is why the FijiFirst Government has put in place systems and processes to ensure that the money is put to good use,” he added. The scam, in 2001, involved US$13 million (F$27.18 million). A number of people were convicted and jailed. It was also alleged at the time that the scam was a part of a vote-buying exercise.